NEW: Quadrants analysis & the Big Five dimensions! * Choleric temperament (= E+ & N+): well developed lower ulnar quadrant [water+] & poor developed lower radial quadrant [earth-] & poor developed upper radial quadrant [fire-] & poor developed upper ulnar quadrant [air-] => lower ulnar quadrant is dominant! * Sanguine temperament (= E+ & N-): well developed lower ulnar quadrant [water+] & poor developed lower radial quadrant [earth-] & poor developed upper radial quadrant [fire-] & well developed upper ulnar quadrant [air+] => ulnar side is dominant! * Melancholic temperament (= E- & N+): well developed upper radial quadrant [fire+] & well developed lower radial quadrant [earth+] & poor developed lower ulnar quadrant [water-] & poor developed upper ulnar quadrant [air-] => radial side is dominant! 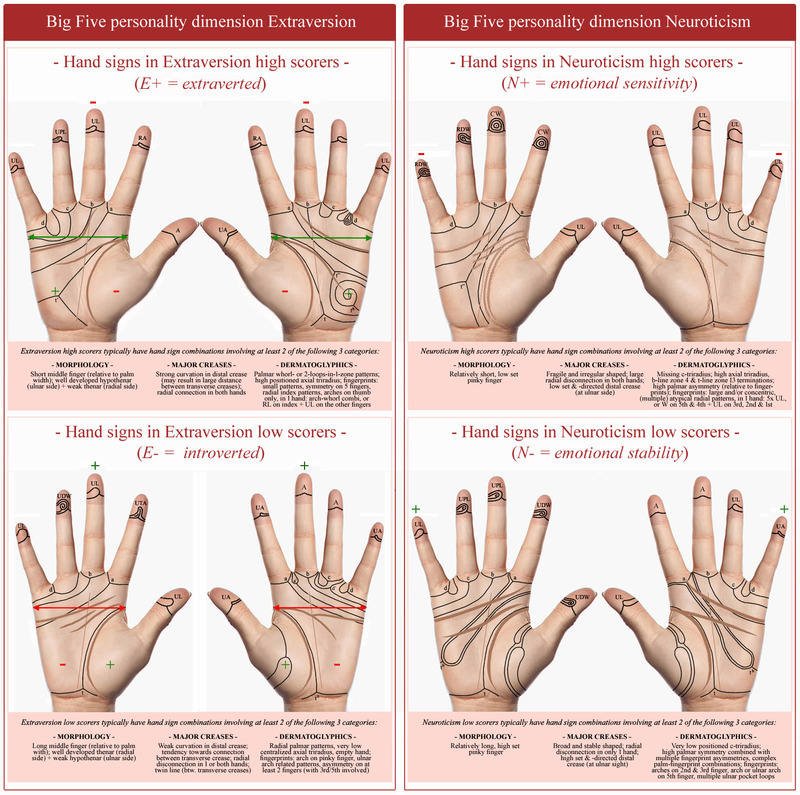 * Phlegmatic temperament (= E- & N-): well developed upper radial quadrant [fire+] & well developed lower radial quadrant [earth+] & poor developed lower ulnar quadrant [water-] & well developed upper ulnar quadrant [air+] => lower ulnar quadrant side is recessive! NOTICE: It's quite fascinating to see that the choleric temperament - which is known for it's open expression of 'emotion' - becomes associated with a dominant lower ulnar quadrant [water+]... which appears to confirm the idea that this zone represents the seat of emotion & intuition!!! For more advanced considerations including the MAJOR CREASES & DERMATOGLYPHICS, check out the HandResearch homepage!